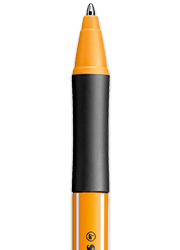 Discover our wide range of writing instruments including fineliner and fibre-tip sign pens, fountain pens, rollerball pens and ballpoint pens. 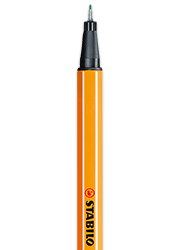 The STABILO point 88 is the perfect companion for schoolchildren, students and professionals. For a relaxed feeling whilst writing – the tip does not bend or break. 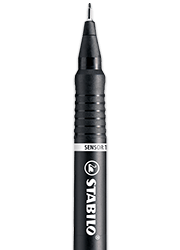 Your favorite ballpoint pen, but even better! 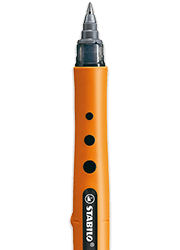 The tool for hard work with an indestructible rollerball tip and a non-slip smooth shaft. Perfect for neat and tidy handwriting of stylish writers and real collectors to stand out. Doesn't blot, doesn't scratch and comes in a large variety of designs. 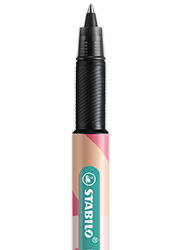 Whether it's just a few notes on a music sheet, underlining words, structuring an extensive essay, doodling in class, meeting notes in the office or just a quick note to friends, STABILO is up to the challenge! Quality designed pens with a variety of different writing technologies including fineliner pens, fibre-tip sign pens, rollerballs, ballpoint pens, fountain pens, marker pens and pencils. All of them provide reliable writing performance and comfort. How did the STABILO pens get their light stripes at the edges?How did the STABILO pens get their light stripes at the edges? 1928 - a day like any other. In the paint shop of the Schwan pencil factory in Nuremberg a batch of pencils rattled through the coating machine. The freshly-painted wooden shafts gleamed brightly as they left the machine. But something was not quite right... The foreman and machine operator discovered to their horror that the hexagonal pencils all had light stripes at the edges. However, what at first seemed to be a mishap turned out to be an important design feature. Since then, Schwan pencils have been deliberately given light stripes down the edges, with this typical brand recognition feature registered as a trade mark that very same year. Is STABILO point 88 ink permanent?Is STABILO point 88 ink permanent? 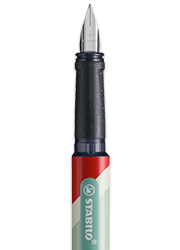 There is no ISO standard for permanent fineliners in general and therefore none especially for our STABILO point 88 either. However, the inks are more than sufficient for office use as they can neither be erased with ink-eraser nor easily oxidised with chlorine solution. In addition, in a test of archived documents kept in folders for 10 years the STABILO point 88 ink was still legible. When did humans start writing?When did humans start writing? Some 50,000 years ago our ancestors were still chiselling stories in stone with flint and painting on the walls of their caves with plant dyes. For thousands of years, pictures were their only means of communication. The ancient Romans used a stylus made of pewter or lead to write on wax tablets, papyrus or parchment. Implements made of lead, pewter and silver were used for writing and drawing until the late Middle Ages. Change came with the discovery of graphite in England around 1550: this new material was soon known throughout Europe.